Belgium's first kit gets an automatic F from me this year as it seems Adidas has put absolutely no effort into this design whatsoever. It's boring, ugly and in no way unique or interesting. But the alternate design is really the one that is worth talking about. 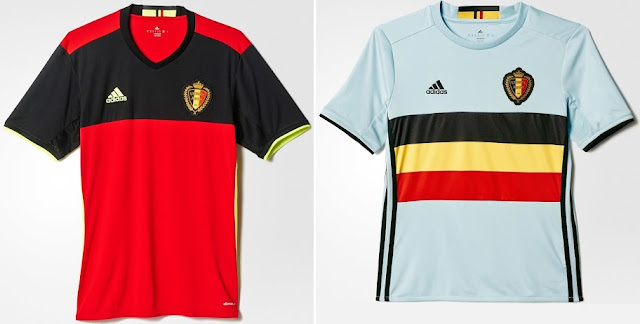 Personally, I think it's hideous and that the baby blue color looks absolutely awful together with the colors of the Belgian flag. That said, the idea behind it is quite interesting as Adidas decided to use the Belgian cycling jerseys as inspiration for this design. Basically, these kits would get an epic fail mark if it wasn't for the bonus point I give them for thinking outside the box. 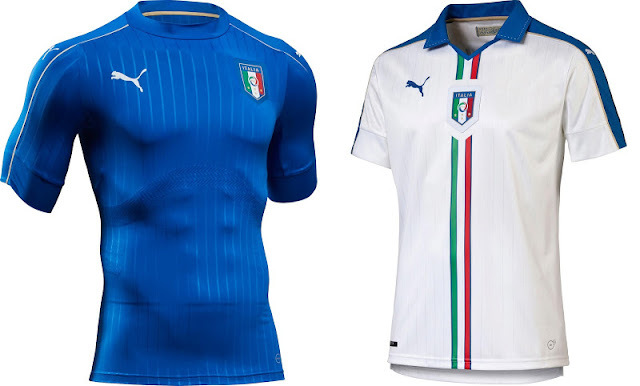 Puma has managed a nice clean classic look for four-time World Cup champions Italy. The main shirt features subtle stripes, with the blue-on-blue working very well. The alternate shirt will stand out on the pitch with the Italian flag running right down the middle of the jersey but without overpowering the shirt design. Overall, I like these shirts for being both simple and well balanced while featuring unique characteristics. 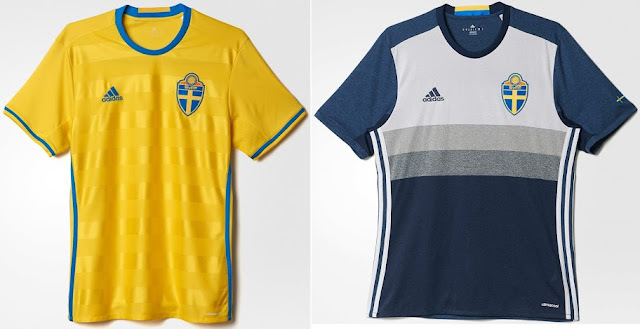 Sweden's first kit is nothing to write home (or blog) about, but it's the alternate design that brings the nation's shirt design up in the overall grading. Like it or not the design is quite unique and will likely stand out if Sweden manages to wear them at some point this summer. Based on a similar design created by Adidas for Juventus prior to the 2015-16 season, the blue, white and grey shirt features a background pattern that makes it look more like a cotton shirt rather than a normal football jersey. 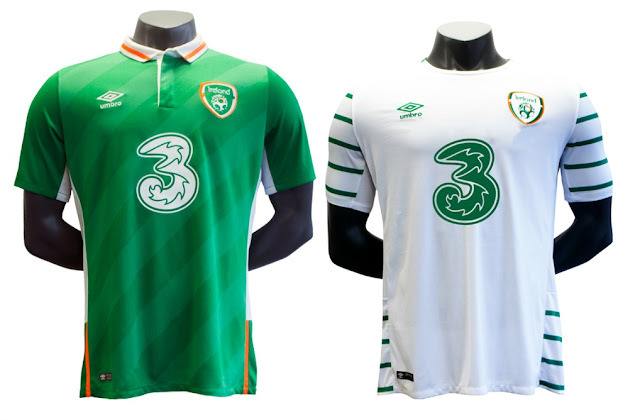 Aside from the sponsor, which is bothering me less and less with every year I see it on the Irish shirts, I love absolutely everything about this year's Republic of Ireland kits. 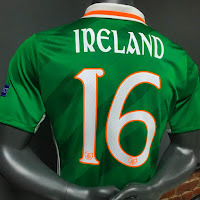 The main jersey is a crisp classic Irish look with the two-tone green, the white collar that stands out so well and of course the slight but visible orange trim. The alternate white shirts are also great with the horizontal green stripes taking over the sides of the jersey and it's the lack of said stripes on the front which I applaud Umbro for the most as it makes the design unique and the stripes not overbearing. I do unfortunately have to take a mark off for the overly "Irish" font of the names and numbers as the cheesy attempt ruins an otherwise beautiful creation. 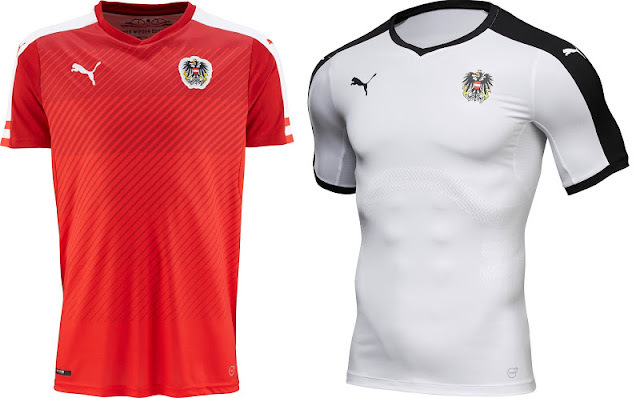 A nice clean look for the Austrians from manufacturers Puma, but without any real unique features this kit design is just too plain. While the main shirt has signs of two-tone stripes the alternate is simply boring. 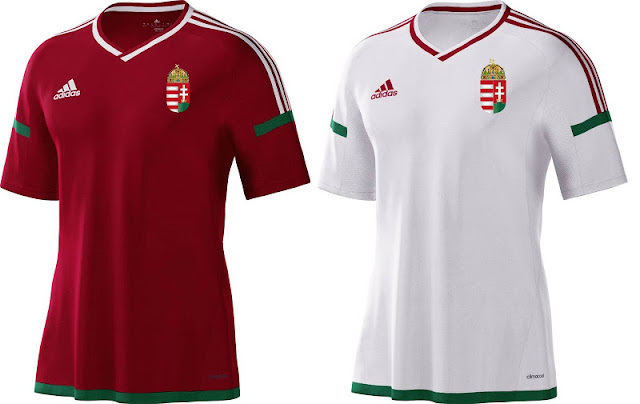 The Hungarian national football team's last appearance in the Euros was in 1972, with their last major tournament appearance at the 1986 FIFA World Cup in Mexico and it sure seems that Adidas got their inspiration for the nations kit from around that era. Plain and boring is about the the only way to describe it, and while I am a big fan of simple designs, simplicity does not have to reflect lack of creativity. To make matters even worse...this design was picked by a fan vote. 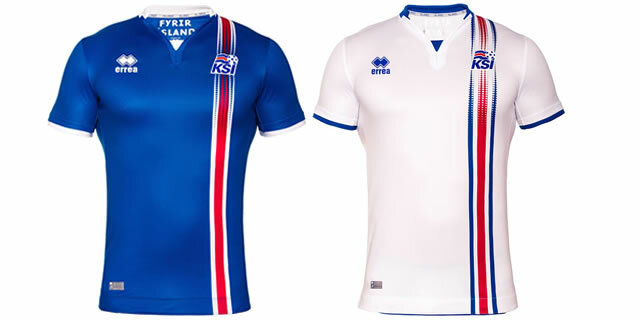 Iceland's Errea kits are a perfect example of how a simple clean design can also be unique. A simple feature such as the vertical design on the left side of the nation's shirt will make them stand out on the pitch without being busy and overbearing. The doted design together with the gradient as it gets closer to the crest is a nice touch. 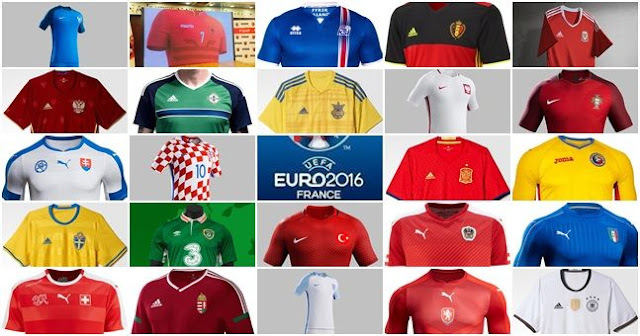 All of Nike's kits at the Euro 2016 tournament are based on the same cut and template. But while Poland, Turkey and Croatia feature truly unique designs, Portugal's concepts resembles more those simpler ones of England and home nation France. 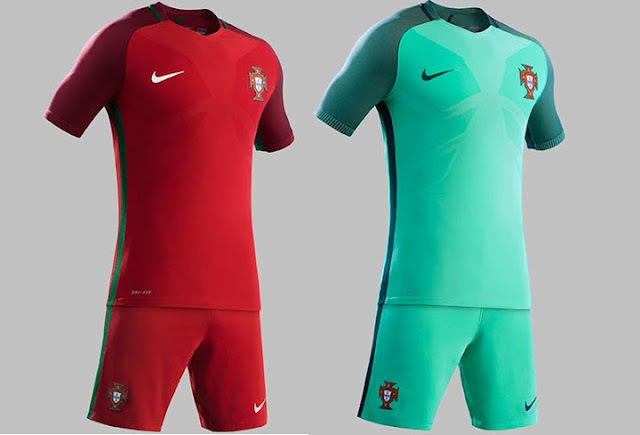 But while France's look features the two color sleeves and England's at least a color combination that has never been used before, Portugal's shirts offer absolutely no unique characteristics and are perhaps the worst of the Nike lot.